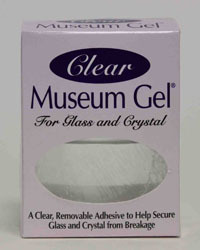 Main benefits Protect precious breakables from bumps, tips and jostles with Museum Gel. Completely removable, reusable and non-toxic. Use on Primarily for glass-on-glass applications, although it can be used on most surfaces.